The first time I met Misty was following a recent eye exam. The ophthalmologist and techs had already been singing her praises. When she looked at my prescription, she said her vision was just like mine. In fact, I later learned that the difference glasses made for her as a nine year old ignited a determined pursuit to help others with vision problems. 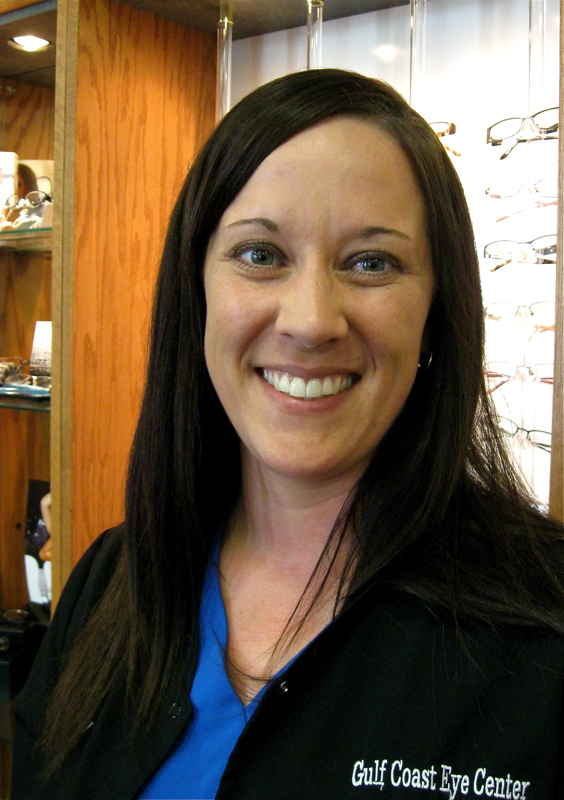 And she has never tired of her role in bringing corrected vision to children and adults. From our interaction, I quickly realized that she is the most observant, thorough and helpful person who has ever ushered me through the process of being fitted for new eyeglasses. Throughout my teen and adult years of wearing glasses, a number of major and minor aggravations related to eyewear have plagued me, some short-term, others longstanding. No one had ever resolved them. Oh, there were occasional temporary fixes, but never even a hint of the cause and how to keep the issue from recurring. Misty provided a different experience. Hubby and I were preparing to settle into available chairs to wait my turn when Misty invited me to look at the selection of women’s frames while she finished up with the person ahead of me. She alerted me that the frames were arranged smallest to largest, from right to left. If I needed bifocals, I needed to head to the section on the left. Well, all of that was a first, I thought. By the time Walter and I had selected a frame, Misty was ready. Before I even brought anything up about problems I wanted to avoid, she was explaining what she needed to do to make first one and then another problem that she pointed out go away or to insure that I got the best results from my progressive lenses. I was overwhelmed. Had I just encountered poorly trained or unconcerned practitioners all those years? Probably. I know I even met one who was unscrupulous. Even though he was associated with the practice of a doctor who had a good reputation in our community, he lied about the availability of a particular frame to push a more expensive alternative. Misty’s own vision experiences have made her conscious of the important difference her work makes in people’s lives. She interacts as if she were an educator and an advocate for all of us visually impaired souls. And I think that is exactly what she is. It will be a few more days before I have my new glasses. Several issues with my old ones were magnified because they affect my balance and other post-stroke challenges. The saga is not yet complete. But Misty’s part of the process continues to give me hope. And to top off my visit, at the checkout window I picked up one of her business cards. Her full name hit me. “Really?” I grinned at the lady behind the counter. The name on the card? i laughed out loud at the punch line to your story. to funny... and what a blessing to find someone like her... i have had good ones and bad ones and also had the lying thing done to me. i wanted frameless and had been wearing them for years, he said they no longer carried them, and i bought new frames. i despised the new glasses, so a week later went back and asked for the manager. i told her i wanted my money back and she said why, i said i like frameless and you don't carry them anymore, so i will go somewhere they do. i hate these frames, they are to heavy. she said who told you we dont have frameless, i said the person who sold me these... she found a perfect pair of frameless and a few days later i had the ones i like. What a cute name, considering her occupation! Lol. Glad you had such a nice experience with Misty. What an exciting thing to meet with an eye person who is so functional. What a great experience. Just love the name. Cool punch line to a neat story. What a blessing to have found her. I don't think I have EVER been happy with new glasses and usually blame it on the fact that they have me pick out my frames after the exam when my pupils are still dilated to the point that the world is a blurry place. Your post certainly struck a note with me. I think buying glass frames is one of the hardest jobs out there. I have never felt like the technicians really cared to give the customer much help or direction. You were truly blessed to find this young woman. I love her name! I love her name too. I do think you found an Optical Angel. Your new glasses will definitely help in your recovery. My friend is an Optician and even though I can't use her business because of insurance, she goes with me to choose frames, correct lens and to make sure they are fitted properly. I am forever grateful. She knows far more than some of the front desk people. Can't wait to see your new specs. It's always great to encounter a person like Misty--and her last name is just perfect for her line of work, huh? I bet she is teased a lot. Opticians loom large in our lives too. Beloved’s eyesight is very poor and mine is getting worse too. I have worn glasses all of my life and have one eye which is almost useless. We have a good practitioner who is very thotough. I couldn’t bear the thought of going blind. Make sure Misty remains your first-choise person.